*This post was sponsored by Kate Spade. Thank you for supporting the sponsors that help make A House in the Hills what it is! Everything about this outfit is spot on! That coat is fall perfection. I want to raid your closet! I'm seeing this bag everywhere! 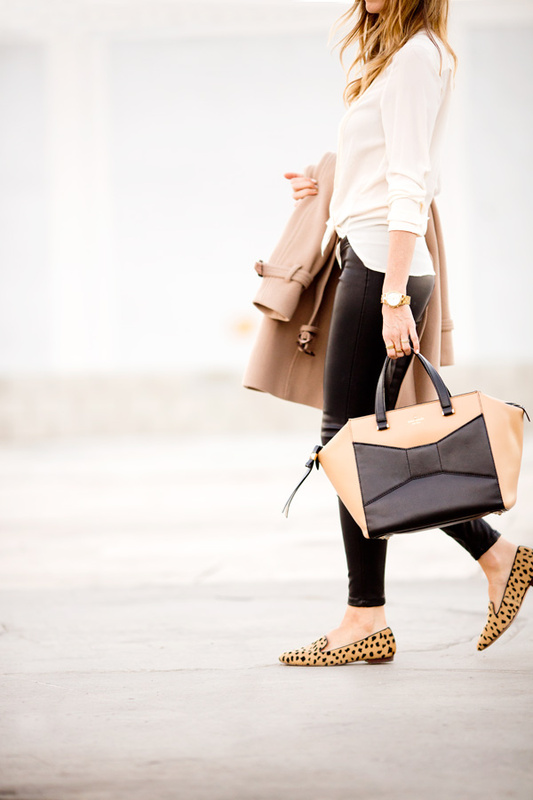 Love the combination of beige and black and the cute choice of print flats. Very chic!! The Beau bag is gorgeous! I love it's structure and the whole color scheme of this look. Love this — the accessories are perfection! sooooo cute! love that bag. loveeee those pants! and that is my favorite color of the beau bag – so cute!!! Black and tan does make for a very classy color combo! Your look is so chic, and I'm in love with your white blouse. Beautiful! Could you please tell me about your lipstick ? Perfect look! Colors, textures and shapes 😀 One of my favorites!